I’ve been dabbling in sketching lately. And even though I know I will get farther by putting in time actually drawing rather than reading about it, I can’t avoid picking up a how-to book from time to time. 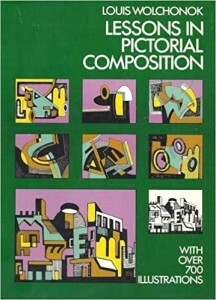 This week it was a $6 second hand copy of Lessons in Pictorial Composition by Louis Wolchonok from Bucknucks Books in Qualicum Beach. It seems that I only have to substitute the word ‘story’ or ‘writing’ for ‘picture’ or ‘painting’, and I can find a parallel in writing – whether it’s fiction or nonfiction. I am going to have to spend a little time determining which story elements might equate with ‘weights’, ‘direction’ and ‘shapes’ in his theory, but values and moods easily find an equivalent – in my mind – in my work. And Wolchonok’s approach to creating tension in any piece of work is a good reminder of what drives story and helps a piece of work resonate with the reader.